The LVCN-131 & LVCN-141 series have been discontinued. Please contact our Flow Engineering department for a viable replacement. The LVCN-141 flow switch controller is commonly used as a low flow shut off for pumps or process protection with a single switch input. The LVCN-131 flow switch controller is commonly used as a dual low flow shut off for pumps or process protection with two independent switch inputs. Select the FST-200/300 or FST-320 series flow switches only for use with these remote relay controllers. CE Approval: optional; complies with EN50082-2 immunity, EN55011 emission and EN61010-1 safety standards. For CE approved controller, add suffix "-CE" to the model number, add $50 to the price. The CE approved configuration complies with EN50082-2 immunity, EN55011 emission and EN 61010-1 safety standards. 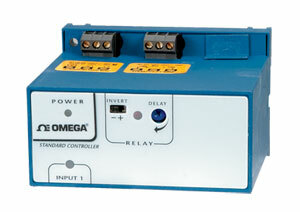 Select the FST-200/320 Series only for use with these controllers.